I am a little more excited about this crop of commanders than I was for the ones in the last Ravnica set, gotta be honest. 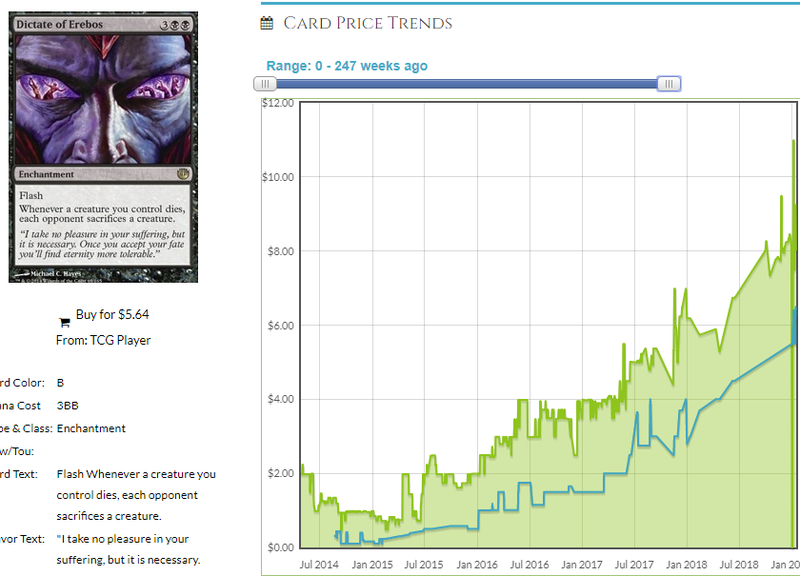 Niv-Mizzet was the most popular and he wasn’t even new. Lazav proved unwieldy, Izoni proved underpowered, Trostani proved unpopular, Ral Zarek proved to be a Planeswalker and Aurelia proved to be bad even in Standard. This new crop, however, is exciting. I have already discussed a bit about how I think Prime Speaker Vannifar is bound to give us some delicious new possibilities and will also be a boring, linear deck that everyone is going to hate out immediately. That won’t deter speculators from hoarding Intruder Alarms because that combo is so obvious, people who don’t play EDH thought of it. I hope you snagged Alarms when they were still $6 which was the price they were when I tweeted about it. Following me on Twitter seems like a good idea since it’s free and a lot of you pay money to get my opinion on stuff. What ISN’T so obvious that even a non-player could think of it is basically every card in the Vannifar deck that isn’t Intruder Alarm or Thornbite Staff and every card in every deck built around every other commander. I think the stuff in the Teysa Karlov deck is just as obvious as the stuff in the Vannifar deck so I am going to run through that today. That’s it. Magic Finance can be hard sometimes but my method has refined itself enough over the years that we don’t need to pretend it’s more complicated than it is. It’s simple but it also relies on me paying attention to stuff you don’t want to pay attention to. Well, I did that, and here’s what I came up with. Teysa Karlov is a very interesting creature – so interesting that most people forget she has a second ability. Creature tokens you control have Vigilance and Lifelink? Could that ever possibly be relevant? I think so, and people who build the deck are going to notice. 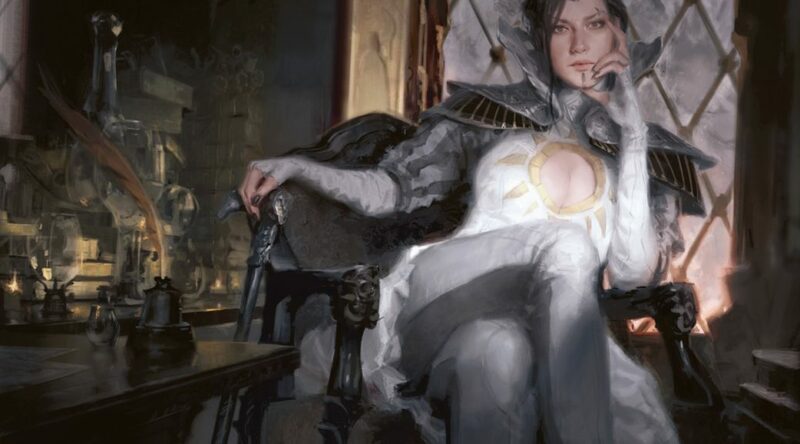 In this way, Teysa is the perfect commander for a deck with creatures with Afterlife, which is a much smaller number of creatures than we anticipated. However, it isn’t just afterlife that is affected here – all of the “on death” triggers that Black decks normally use to great effect are doubled and that makes her brutal. You don’t need to haphazardly jam a bunch of mediocre creatures with Afterlife into the deck just because she synergizes with that ability and indeed people beginning to brew with her aren’t. You have better ways to make creature tokens and you have better ways to take advantage of her first ability, too. Let’s look at some cards I really like in the wake of this printing that haven’t spiked yet because, again, they are slightly less obvious than Intruder Alarm and that’s basically the only reason. 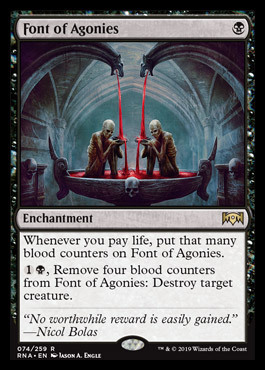 Font of Agonies is a card that has people talking a lot. There are a lot of good ways to put counters on Font and the ones that people who write about EDH and have tens of thousands of readers aren’t even always that good. Bennie Smith said he wanted to pair Font with another way to kill creatures. This is… a card, certainly. I don’t know if you pull these out of bulk per se because Bennie talked about it. This isn’t the worst card to pair with Font and while Font won’t make it into every Karlov deck, the fact that your tokens will gain you life should mitigate the life you pay and I think Font is an attractive inclusion in the deck. So if I don’t like Slaughter despite it putting enough counters on Font to kill another creature, what do I life? So glad I pretended you asked. Here’s a card that just got a reprint and won’t likely get one soon. Here’s a $5ish mythic from a set whose prices are beginning to recover that is in 15,000 decks on EDHREC and does a great job of putting counters on Font. Don’t think you want to run Font? That’s cool because it turns out Necropotence is just fine in a deck that has a bunch of lifelink tokens running around. You’ll draw a ton of extra cards with this and it’s honestly cheating in EDH. The triple Black is no issue in a 2-color deck and honestly I’m not sure why Necropotence isn’t banned in EDH. It’s not, it’s not fair and that’s fine with me. 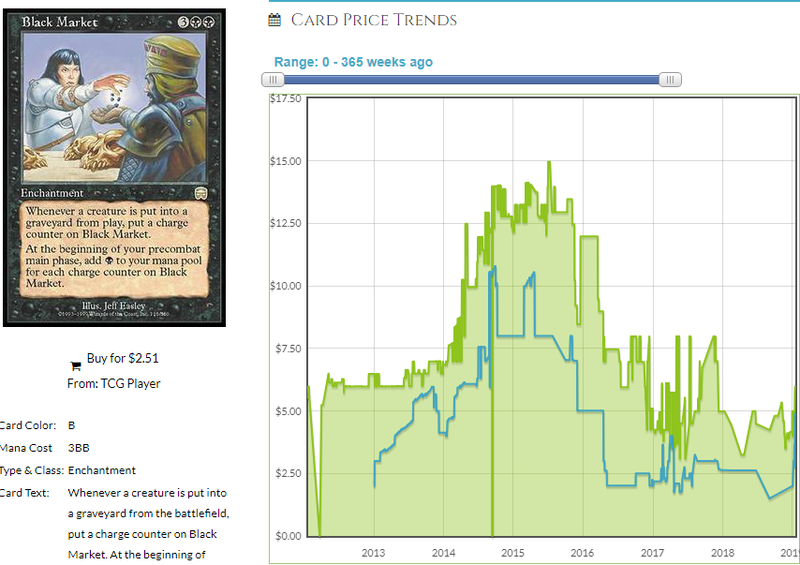 Both the retail and buylist price are rising on this and Card Kingdom is charging twice what TCG Player is. These are too cheap right now even having grown a few bucks over the last year, so get them now. 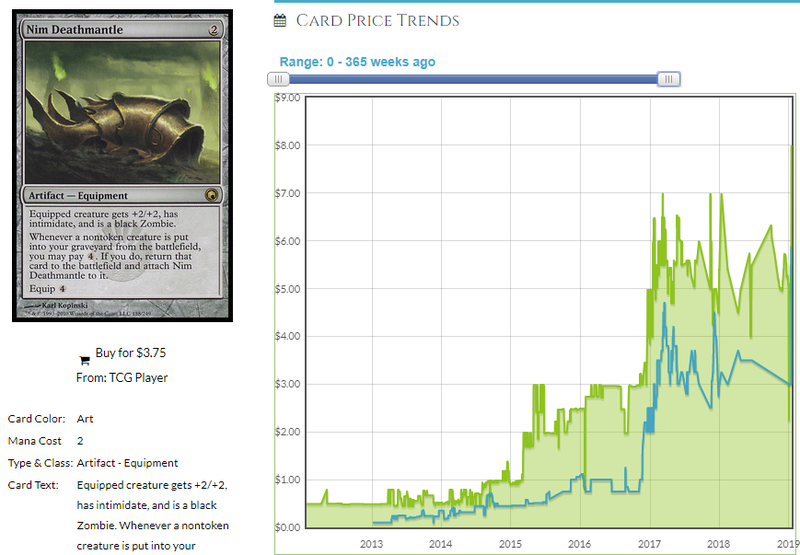 This is a slam-dunk inclusion in Teysa decks but it’s also an EDH staple that just got a reprint and is seeing the price rebound. Remember when these were $0.50 and then I went on the Command Zone podcast and told people I bought 200 of them and they should buy some, too? 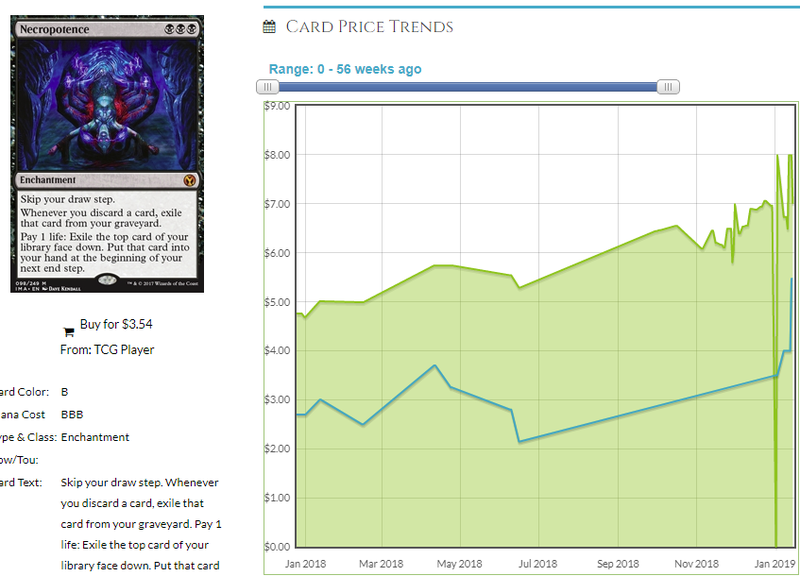 I don’t think that appearance had as much to do with this precipitous climb as the fact that the card was a $0.50 substitute for a $12 Grave Pact but as those two prices converge, it’s looking more and more like you just play both and a lot of people play Butcher of Malakir as well. In a non-Teysa deck, Dictate of Erebos is brutal because saccing a creature token for mana to an Ashnod’s Altar or flinging it at them with Goblin Bombardment triggers the Pact and makes them sac a creature. In a Teysa Karlov deck, that happens twice as long as Teysa is in playsa. That’s what we call “value” in this bidness. Black Market took quite a hit in 2015 but it seems to be on the cusp of making a comeback. 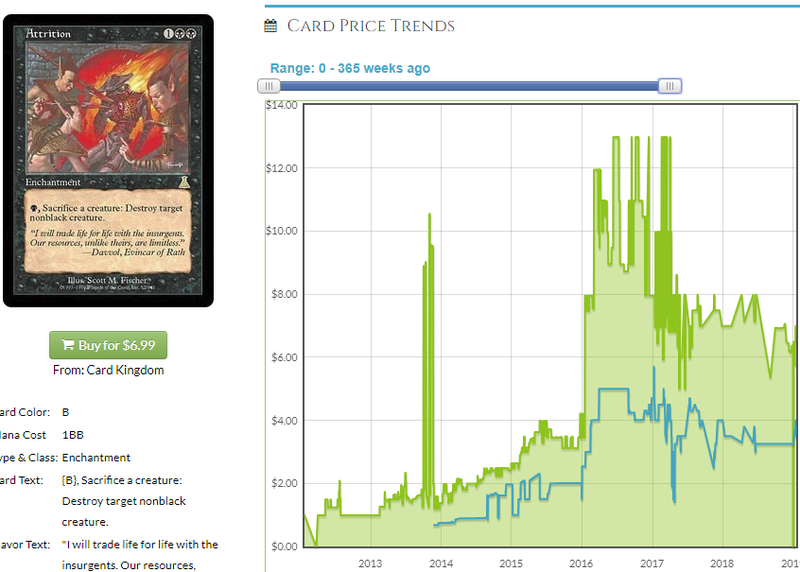 Card Kingdom wants $5.50 for it and TCG Player isn’t too far behind with a market price of $4.89. I don’t expect this to stay under $8 forever and with double the charge counters with Teysa Karlov, I expect plenty of people to auto-include this in their Karlov decks, especially since you’re getting double counters on death triggers. Suddenly your Ashnod’s Altar can generate even more value when you sac a dork. A Conspiracy printing hacked the legs out from under this card but as much as 6 mana and a death trigger was a pretty “fair” rate before, with the trigger doubling, this is a very efficient way to dump your hand, especially in a deck bound to be playing big, expensive creatures like Kokusho and Sun Titan. Gettable for as little as $2.50 on TCG Player, this never really hit bulk rare status despite the reprint even though people ship me these in bulk all the time. If you’re not lucky enough to get these by accident, don’t worry, it’s likely retail will catch up with reality and a hundred bucks or so at $2.50 per will likely look pretty good pretty soon. Remember the good, old days when these were under a buck? It’s been a long time since that was true and while I saw it coming, I don’t have as many copies as I would like. I sold a LOT at that first $3 plateau and while I’d like to kick myself for lacking the foresight to wait a whole year to see if they moved again, I’m not mad because I reinvested that money wisely. 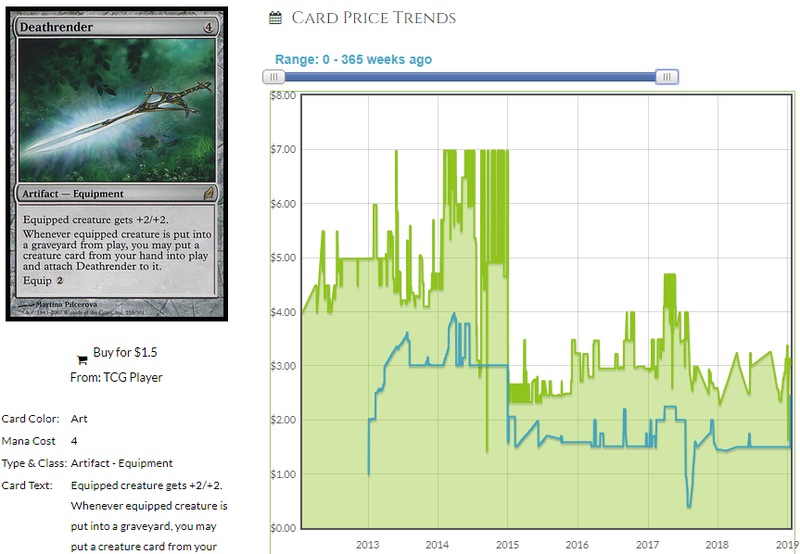 I don’t think this will ever be cheap again barring a reprint and how likely do you think a reprint is? They left Manamorphose out of Ultimate Masters so it’s clear they miss stuff. I bet this miss this card that sneakily climbed to within striking distance of $10 without anyone making a big deal out of it. I honestly don’t know how much longer Attrition can stay under $10. Then again, I don’t know why it went down after it spiked near $17.50 years after it was reprinted. 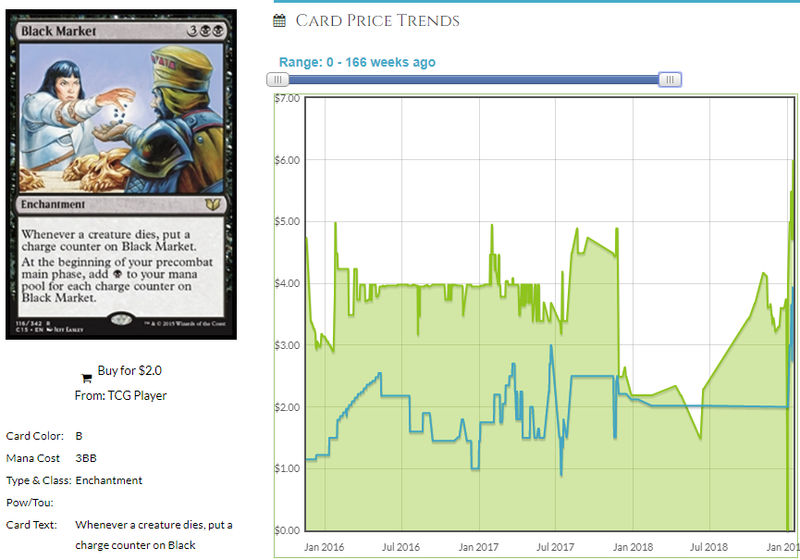 If I had to guess, it’s not getting played much in new decks and if you look at the decks where it’s used most, they’re pretty old. Demand is not what it used to be. That said, with Teysa Karlov turning 1/1 tokens into two death triggers for 1 mana in situations where you don’t have a Dictate of Erebos in play and 4 death triggers where you do, I think it’s safe to say that Attrition is going to come back into favor very soon and while I don’t know if it ever flirts with $20 like it did back in early 2016, I think cresting the $10 point and going above and beyond is pretty reasonable. 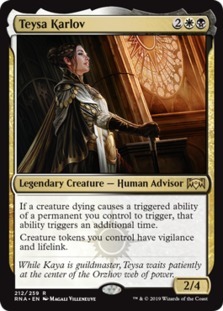 I don’t know how popular Teysa Karlov will be but I do know she’s a better commander than any commander in Guilds of Ravnica. Is that damnation by faint praise? That remains to be seen. What I do know is that Guilds was not very popular for builders. Do I expect more than 27 people to build Teysa Karlov decks? I sure do. I think more people will build Teysa than built Niv-Mizzet. I’m counting on it. One last thing before I go, one the issue of Guild Kit reprints, people are worried about their specs ending up in the kits. Given that only cards from Ravnica sets will appear in the guild kits, I think there are very few cards you need to worry about. I think there’s a real possibility the Orzhov one could be as good a buy as the Selesnya one was but even if it’s not, let’s quickly look at the cards I think will get hit. Nothing else is really that much of a beating, financially, so I wouldn’t worry about it. That’s all for me this week, folks. 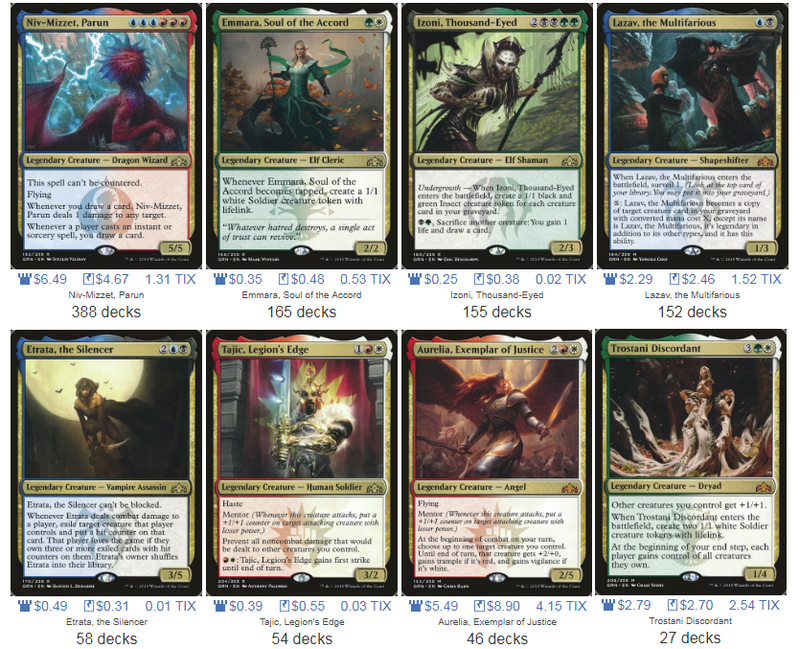 I recommend brewing a Teysa Karlov deck of your own and thinking about what you’d put in it. 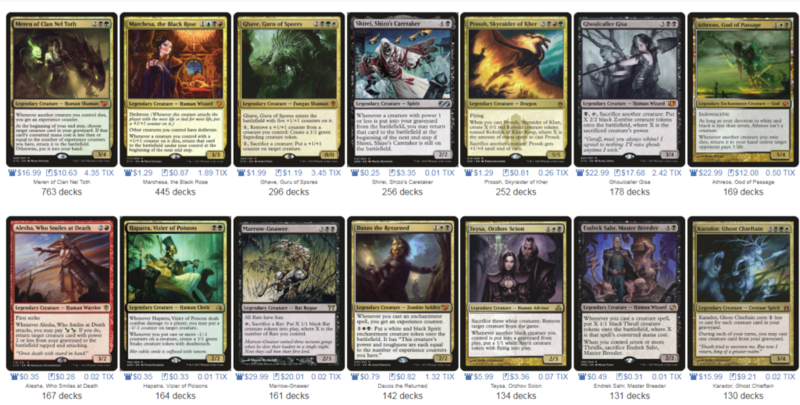 Skullclamp seems good, Phyrexian Altar seems good, Twilight Drover seems good and Divine Visitation seems good. Decks that get a loop going with Karmic Guide or Nim Deathmantle seem good and cards like Archon of Justice that are much better when doubled deserve a look. See what other people are building, brew yourself and make your decisions based on that. Or just spend $300 on copies of Attrition and if enough of us do that, it doesn’t even matter if I was wrong (I’m not). Just kidding about that last part, don’t do that. But do come back next week where I’ll have some more tips, possibly predicated on some actual data. Until next time! Previous PostThe Watchtower 1/14/19 for ProTraders – Plan Your SpecsNext PostFirst Week of Allegiance!